Presidents, “we are a nation of laws,” my mind started to wander in many directions. Justice is not the forte of the US, and 2014 has not shown any sign of progress in that department. After Trayvon Martin’s murder in 2012, Michael Brown in Ferguson (Missouri) and Eric Garner (Staten Island, New York) were added to the list of cops’ victims in 2014, just to mention the most famous ones. And the culprits, Darren Wilson and Daniel Pantaleo, are free to carry on with their lives. Undoubtedly, there are many people like me who saw the video of Mr. Garner being chokehold to death and cannot figure out how Daniel Pantaleo has been set free by an Staten Island grand jury. A sophisticated commentator on The Brian Lehrer Show last week pointed at the prosecutor engineering the grand jury’s decision through a “smart framing of the narrative.” I surely am no law expert, but I cannot fathom how Pantaleo’s narrative as reported in The New York Times, did fly: Pantaleo did indeed report that “after he released his grip, he held down Mr Garner’s head down Mr Garner was not injured by other officers rushing in, as well as to prevent Mr Garner from possibly biting one of them.” That ‘s all there is to it, folks. 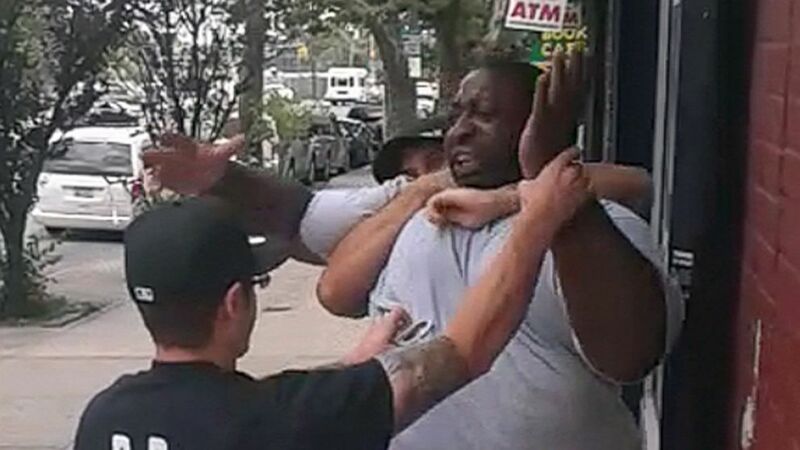 Pantaleo was here to protect, and did protect Eric Garner from his colleagues and his colleagues from Eric Garner. It did not work for Eric Garner, but what seems to have mattered for the Staten Island’s grand jury is Pantaleo’s intentions: to protect. Holding for cultural differences – the US is a cop-loving country, while where I come from, the love of cops is not exactly part of one’s DNA- this self-righteous justification of a crime with the intent to protect gives me goosebumps, as I have heard it so many times from ex against any attempt on my part to have a role in my girls’ life, or simply to know about them. Speaking of protective chokeholds, I recently asked my ex where my youngest daughter, 17, was planning to go to college. Ex’s email reply: Sorry, this information concerns her future adult life. I am here to protect her future privacy (she was already bestowing her with the mission of extending her motherly protection to my daughter’s adulthood). As I insisted that by our divorce agreement, she had to provide me with this information, I received an email, supposedly from my daughter, whose style and message revealed mom’s craftsmanship: Hi, sorry (no “Dad,” an intolerable greeting for mom) but I cannot give you this information because you will post it on your stinky blog (in fact, it is mom who has a grudge against this blog… Let’s say she likes to protect unnoticed). I am 99.9 percent sure that mom impersonated my daughter, but hey, even if I could prove that in a court of law, she would claim it was all for my daughter’s own good . It’s time for the justice system to clip the wings of the Pantaleos of all kinds, cops and alienating mothers; for the sake of their proteges, whom they keep from breathing. It just takes precedents.